Challenge 2 sponsored by Bio Seaweed Gel (BSG) asked our contestants to create a set of under the sea-inspired 3-D gel sculpted nails across five nail tips based on BSG’s In Too Deep fall collection. They were also asked to make a short video diary and tutorial showing us how they created the nails. This week’s guest judge was Hellen Luu of Bio Seaweed Gel. 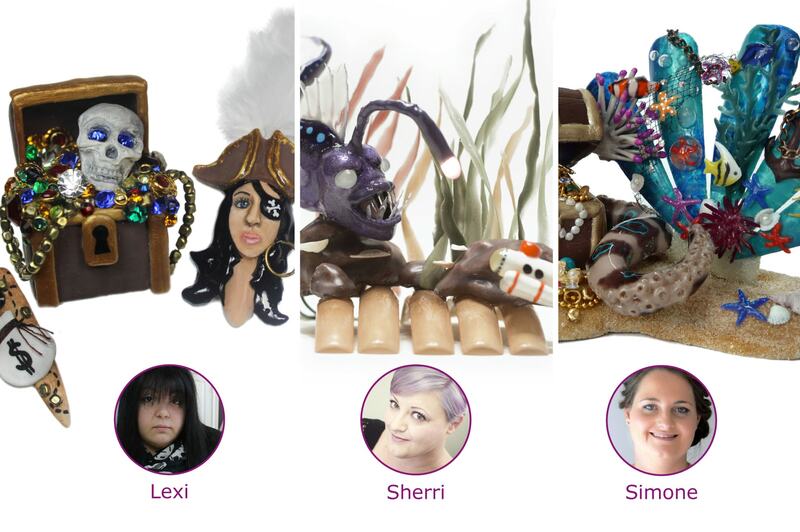 Permanent judges include CND’s Jan Arnold, NAILS Next Top Nail Artist 2014 winner Ryoko Garcia, NAILS editor Hannah Lee, NAILS senior editor Beth Livesay, and the rest of the team at NAILS Magazine. Lexi Martone: The judges were impressed with your excellent sculpting techniques — watching you sculpt that skull with the e-file was amazing. The treasure chest was also impeccably built. We love that you created all of your own coins. Your videos are consistently the best and we’re always excited to watch you create with your unique sense of humor. The judges were split on your map nails, some appreciated the restraint you used by keeping those more simple, while other judges were left wanting more 3-D elements on the map nails. Sherri Traweek: The judges especially love your imaginative take on this challenge. Your deep sea monster is scary and perfectly created. What a great touch with the light! (But we didn’t get to see how you did it!) Another highlight for several of the judges was the ethereal gradient seaweed. Great demo of that portion of the design. You also did a stellar job on the video and we love your on-camera personality. We wished we could have seen a little more sculpting or design on the actual nail tips instead of them simply being a solid color base for the rest of your sculpture. Simone Gilbert: The judges were impressed with all the ambitious detail you put into every aspect of your piece — the coins and jewels, the real water bubbles, the reef were all so precise and remarkable. The tentacle was a standout. We wanted to see more of that creature because it was so life-like! Your video was very good and we liked seeing how you created some of those interesting details like the sea urchin. Some of the judges noted that more of your design was “off” the nail tips than “on” the nail tips, and they wondered if your extra “props” outshined the nails themselves. Lauren Boyd: The judges really liked your original take on the theme. The wrecked ship was carefully constructed, and your realistic water with color variations and movement came to life off the nails. We were torn when it came to combining the nail tips to create a larger base. Some of the judges thought that was quite innovative, while others thought it made it look like you missed the mark on the challenge requirements. Your design was one of the favorites of this week’s sponsor. For your video, you can spend less time describing your inspiration and more time showing us your process. We’d love a better angle on your video because we couldn’t really see what you were doing. Lavette Cephus: The judges really liked how you created your fish scales, and we loved your connection to the book you read as a child. Kudos to you for mixing your own gel colors. We appreciate all the effort that went into making the fish, but we would have liked to have seen how you created the other nails as well. The treasure chest felt a little bit like an afterthought and your five nails don’t seem to be from one cohesive design. Pay attention to the sound levels on your videos. The music was louder than your voice at the beginning of the video and we couldn’t see much detail because your video wasn’t in tight enough. Lini Sherburne: The judges really liked your individual take on this week’s challenge and how your sea creature covered all five nails. The design was cohesive and Steve ended up being both cute and a little bit creepy. The beading on the tentacles was a clever touch. We’d like to see a little more detail on your creature’s face and other 3-D elements either through texture or through painting. And we feel like you could have added additional 3-D elements to create your overall scene. Your videos are getting better and better. You’re a natural on camera and your steps are useful and detailed. Marisol Alvarado: The judges were impressed at your ingenuity to use a mermaid doll as your mold. You never would have guessed that you don’t regularly sculpt with gel products. The detailing on the face and hair is a little too cartoon-like, we’d love to see more artistic detailing to create life-like features. The cute little lobster is a definite standout. Your video is nice and tight and we can really see how you created your design. Amy Gustafson: The judges were impressed that this was your first time sculpting with gel. Great color selection and addition of texture. The coral is a definite standout. The starfish and tentacles have nice movement that makes them look realistic. We like that you challenged yourself and took the initiative to learn these techniques. It felt a little like five separate nails instead of a cohesive art design. It just seems to be missing fun/unexpected details. Work on getting better angles in your video so we can see how you’re creating your design. Also, make sure you have a clean workstation and that your own nails are done. Karrie Bowers: The judges love your choice of colors for the mermaid’s tail and all the little details (clam shell with pearl, bubbles, starfish). We would like to see you refine your sculpting skills and add more detail to your painting techniques. The water/reef detailing on the middle nails is a little murky and we’d like to see more 3-D art (for instance you could have built the coral out instead of painting it on). You have a great personality that comes through in your video, but we’d like to hear your voiceover instead of adding text during your demo. Work on smoother video editing (too many different angles with choppy transitions). Yesenia Oliva: The judges thought your design was cute and liked how you used a seashell as your treasure chest. The puffer fish was an original touch. We’re unsure if you sculpted the bottle and clam out of gel, but that would have been preferred. Overall the piece feels a little disjointed and cartoonish. You need to work on your overall detailing work and techniques to bring your skills up to the next level. Your video is jumpy and the volume level for your voice is way too low. You can’t hear your description of how you created the nails.